What a fantastic flight! On Wednesday, Oct 10, I had the opportunity to fly in the fourth annual Fall Color Flight, organized by Minneapolis-area photographer Max Haynes, who publishes Max Air 2 Air, an on-line aviation photography magazine. 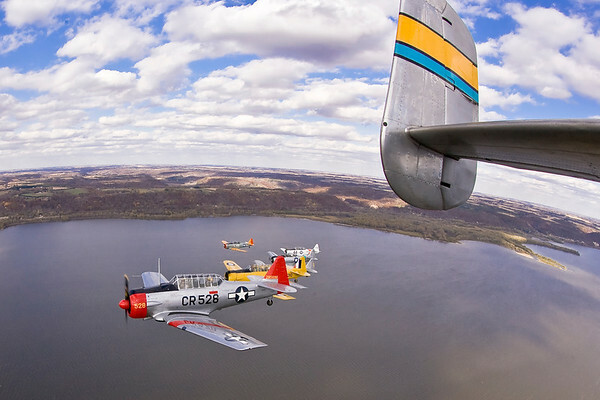 The flight included several privately owned T-6 Texan* aircraft from T-6 Thunder , as well as the Harvard and B-25 Mitchell of the Minnesota Wing of the Commemorative Air Force (CAF). The aim of the flight was to photograph these vintage aircraft against the backdrop of fall colors. Planning the flight ahead of time and predicting the foliage colors is always a gamble, so we had to work with what nature provided. We flew two sorties--one mid-afternoon and one in late afternoon. The early sortie flew south of Minneapolis, along the Mississippi River to the vicinity of Red Wing, where we shot several photos over the Wisconsin and Minnesota countryside. The later sortie flew to the north of the Twin Cities, past Anoka, where the formation rendezvoused with "Sawbones", the racing-modified Hawker Sea Fury owned and piloted by Dr. Robin Crandall. I really enjoyed this day of air-to-air photography, allowing me the opportunity to develop my photographic skills and enjoy the wonder of flight from a vintage warbird--I photographed all of these air-to-air shots from the CAF B-25. I'd like to thank Max Haynes for allowing me and some of the other local photographers to take advantage of this opportunity. View Max's beautifully presented photos in his Fall Color Essay. * The North American Aviation T-6 Texan training aircraft of WW II was known by several names, depending on what service was operating the aircraft. The U.S. Army Air Force called the aircraft the Texan; the U.S. Navy referred to it as the SNJ; our British allies and her commonwealth partners named it the Harvard. All aircraft were basically similar, having minor technical differences. The Texans in formation with the B-25 (as seen from the right waist gun position). Photographer Max Haynes is in the SNJ (gray fuselage, yellow wings) that appears to be flying out of position.